If you’re an Olivia/Fitz lover/shipper/whatever, season five has to be like heaven for you so far. This week, we see what happens after Olivia says “Yes” to the press when she’s asked if she’s the president’s mistress. Naturally, the ramifications are going to be enormous, and they keep us trapped in the White House for practically the entire episode. Still, it’s not like these players haven’t been preparing for this moment for five years, Bellamy Young in particular. Mellie is a polarizing character—you either love her or you hate her—and truth be told, I am on the love side. Even with all her misdeeds, it’s hard not to feel for someone who has gone through as much as she has, only to get thrown under the bus for Olivia Pope. And Young is magnificent this episode, frustrated with negotiations because even the ancestral home in Santa Barbara won’t bring back what she really wants: her teamwork with Fitz, her status as First Lady. Fitz really has just taken from her all along, and she’s right to call him on it. Mellie has always been at her best when she’s the most vulnerable: She either lashes out, like she does to Cyrus here, when she says she wants Olivia and Fitz to basically breathe poison, or opens up, as she does to Olivia as she searches for hooch in the First Lady closet that’s larger than any of our apartments. The idea of Olivia Pope decorating over 100 Christmas trees is laughable, of course it is, and Mellie gets some well-earned digs in there as well. She also changes from her Lady Macbeth red outfit, which usually means she’s up to something, to the more muted dress at the end when she falls into line with Fitz. Until, thanks to Cyrus, she doesn’t. The show has lost a little steam with the lack of Cyrus so far, so it’s fun to see him back in play. The scene where he literally and pointlessly begs Fitz for his job back is exceedingly cringeworthy and painful to watch, but Jeff Perry nails it. 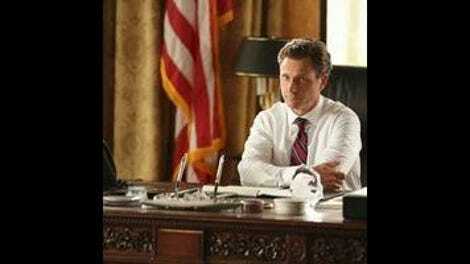 And Mellie and Cyrus on the warpath against Olivia and Fitz is an intriguing path for the show to take. Not as effective: Olivia sitting smugly on the couch like some sort of emperor and nodding or disagreeing with all of Fitz’s decisions. I actually guffawed (not a word I use often) when Fitz chastises her at the end of the episode, “You don’t tell me what to do in the Oval Office” when the entire day, she’s done nothing but that. Fitz is somewhere between a puppet and a giant, hulking lap dog, cruelly bullying Lizzie up against a door in a very disturbing manner, while Olivia just sits there until she finally coughs up, “She’s right, Fitz.” The way he looked in her direction every single time a decision was about to made was a laughable frailty for the conceivable leader of the free world. At one point Abby asked, “Is that what you want, Mr. President?” Are you kidding? How does that even matter? He wants whatever Olivia wants. Olivia, fortunately, also does well with vulnerability, just like in her hotel room scene with Jake last week. This week she actually admits to her not-boyfriend that she may have made a mistake, a refreshing perspective from someone who seemingly has crafted her whole life to never make the wrong move, and pick all the right moves for other people. It’s nice to know that even Olivia Pope can screw up by reacting with emotions over logic, and she may have done so here. It’s created quite a mess for the White House, a mess that will apparently continue next week as Olivia’s reputation gets ripped to shreds. Not faring so well: What is anyone even still doing at Olivia Pope And Associates? Are they on retainer? Does Quinn still get paid? Had to laugh as Mellie refer to this outfit as “that group of thugs,” and she’s right. With Liv in the White House, these clowns have no place on this show. In this episode they literally have nothing to do but watch TV and drink vodka, as they need Jake to point out how useless they are. And, speaking of useless: Oh God, this Louvre-on-fire plot. Please, no. My heart actually sank when I saw Joe Morton’s name in the credits, and after four delightful B613-free episodes, international intrigue does not seem like the next step this show should be taking. Not when we’ve got our own White House soap opera to deal with. 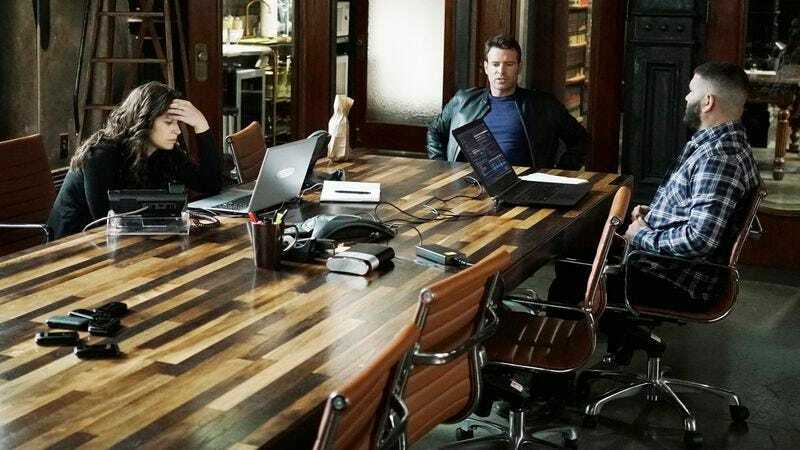 By exposing her relationship with Fitz to the masses, Olivia is wrecking everything she has spent her whole life building. In her best line delivery of the episode, she tells Fitz to sit down and “watch me choose you.” Her career, her reputation, even her ultimate achievement of putting this man in the White House and the deals that made that happen (Hey, remember Defiance? ), now are all inconsequential because of her devotion to that same man. You can’t say that’s not love, but I sure hope it’s worth it. All the shots of feet and shoes at the start of the episode were jarring, but I think I get what they were trying to say. These women all literally have the weight of the world on their shoulders, and they have to do it all in uncomfortable shoes. It’s like the quote about Ginger Rogers: She did everything Fred Astaire did, but backward, and in high heels. Something I can’t explain: That weird, long, silent kiss. “I loved what you said.” Okay, aw. Cyrus, thank you for not saying, “gladiator” in your “rouse Mellie” speech. I am greatly enjoying Mackenzie Astin as Noah; even his banter with Abby seems more natural than forced. This week’s diatribe: Tie between Jake telling what’s left of OAP that they are not part of Olivia’s plan, before drinking vodka, and Mellie drinking out of a mason jar as she tells Olivia what’s in store for her in the White House. So, drinking with diatribes. Hey, even Olivia and Fitz are drinking by the end of the episode as well. Apologies for the lateness of this review: TiVo snafu. Won’t happen again.